This is an example of a custom content page (hosted in a Cyclos instance). Below are listed some of the Cyclos 4 mobile app features. Cyclos offers a mobile app which can be deployed across multiple platforms. By default it is released for Android and iOS, but is created in phonegap and can thus be released in any platform needed. The mobile app is fully featured and contains almost all user functionalities available in Cyclos web. In addition to this, the mobile app uses all the extra features of your mobile device such as the camera, fingerprint, GPS and NFC-chip. For example, the app allows shops (and other users) to generate a QR code on their mobile making it possible for their customers to quickly make a payment by simply scanning the QR code. The app can be used as a complete business or user directory, which allows your clients to find businesses that accept your payments. Your clients can easily find stores near their location on an integrated google map. You can make it even easier for them by configuring categories to make sure the customers find the business that they are looking for. Cyclos licensees can download a customizable app from the Cyclos license server. They can customize the launch icon, application name and CSS, which will give the app the complete look and feel of their own brand. It is also possible to create custom operations for the mobile and to add new buttons with information texts. Large licensees can download the source code of the mobile app, whilst normal licensees can use the GWT compiled code (in almost all cases this is more than sufficient). 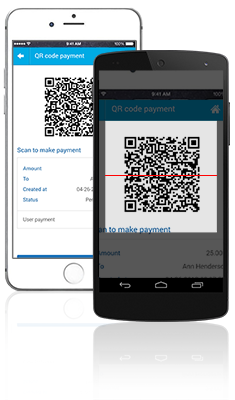 Pay other users by simply scanning a QR code. Do payments or send payment requests with the mobile app. Find shops, restaurants and other services near you on a google map. Restaurants can scan vouchers for quick voucher payment. Login and make payments with one touch of your finger. Create your own mobile features to extend our app. Complete set of e-commerce features: webshop, shopping cart, ads and more.. Create extra content pages for your clients such as promotions, news and announcements. Please feel free to download our app on the app stores to evaluate our app. Cyclos is developed by STRO, a leading organisation in monetary innovations. STRO’s mission is to enable local/regional economies to flourish in a sustainable way.